We are delighted to announce that our Chapter’s House project, shown above, has been shortlisted for this year’s Cornish Buildings Group Annual Awards! 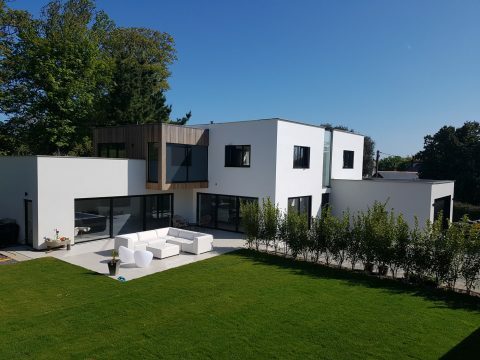 We have been told that “The judges were particularly impressed with the house’s clean and simple lines and with the overall massing and composition.” The judges will visit all of the shortlisted projects on 6th May and decide on the winners shortly thereafter, so watch this space! Having received a Commendation for the Redannick Mews project, shown below, in the 2016 Cornish Buildings Group Annual Awards, “for two sustainable single storey new houses, showing particular imagination in creating a pleasant modern environment rarely provided by major developers.” We are hoping to go one better this year and win the whole thing! Update: Unfortunately our clients were unable to allow us to show the CBG Awards judges around Chapter’s House on the allotted day due to prior arrangements, but we have been assured that we will be able to enter the project next year, so fingers crossed for 2019!